You might have the idea that it's a no brainer for most restaurants to offer a catering menu especially during the holidays, right? Wrong, I can recall times where I've walked into several restaurants where a catering menu was no where in sight unless requested. This might be a big no, no for you restauranteurs out there since catering has the potential to be a major sales boost for your restaurant during the holiday season. Not to mention each year restaurants such as Boston Market is known for their Thanksgiving catering specials, which produce long lines during the holiday week. Catering has become convenient for those who would rather avoid spending an entire day getting down and dirty in the kitchen. The catering business has become a huge help for restaurants and has continued to take off in recent years. According to statistics, catering sales in the United States is estimated to reach over 8 billion in 2016. 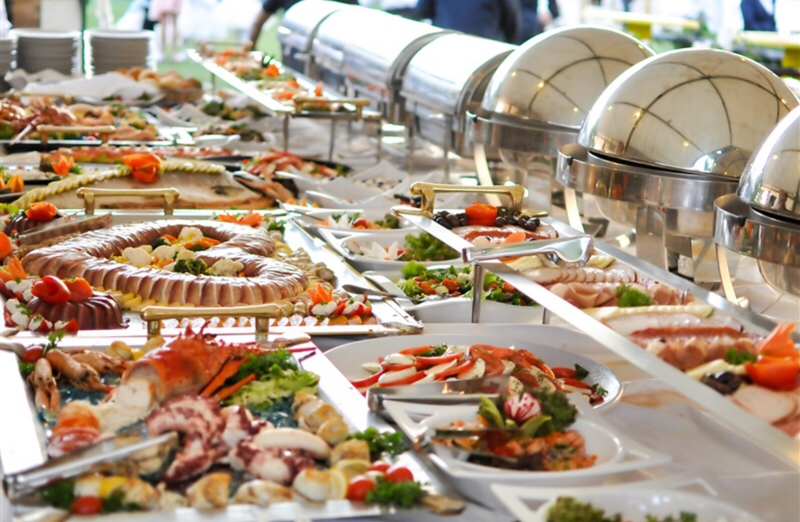 It was also found by the statista.com that independent catering companies and restaurant private dining caterers accumulated the most revenue out of all catering services categories. If you haven't already done so you might want to jump on this as soon as possible. It's not necessarily too late, but you're only weeks away before it begins. Let's take a look at what you will need to make it happen. When planning your catering menu it involves figuring out pricing, description, portion sizing and choosing photos to include. Here are several recommendations to consider: First, provide a minimim of 3 menu choices and at least three options for condiments. Let's not forget everyone has different preferences so it's best to serve all condiments on the side instead of including it in the main dish. Keep in mind it's also a great idea to offer fish or red meats and even vegan options. For dessert, offer a minimum of two options. Fixed pricing - this system is a fixed cost and quantity. For example, you could charge $50 for two servings of filet mignon. Tiered pricing - this is when it's set up as a per person cost. Custom pricing - you have the option to create a custom quote based off your customers needs and costs. As mentioned earlier this is necessary for your pocket book: decide which items to markup that will require additional costs such as extra ingredient. This also means deciding whether to include a delivery service with your catering package and a mileage rate. If your catering service offers beyond preparing the food such as physically working an event you might want to put together a contract with your clients. This will protect you from any possibly liabilities. Another vital piece to the puzzle, research any catering companies in your area and compare prices (Chron). We live in a digital world therefore we tend to forget that being present to our customer base is just as important. Look into promoting your restaurant at city events or other surrounding community events. This will give you the opportunity to touch base with locals and offer samples. Upselling your catering service at your restaurant is a must. I don't just mean popping up a sign waiting for a response from your customers. Your staff members are your key component. Give them the knowledge about your catering service and encourage them to upsell it to your consumers. If you have a website even better! Allow it to be the main front page promotion during the holiday season so it generates the attention it needs and deserves. Promote and market your catering via social media. Posting your services is one thing, but boosting your catering ad is a better option. Whatever platform you might be using research which social media platform will work best for your business. About a month ago, I researched boosting social media ads and boy do they generate engagement! Businesses were also noticing a difference in sales. Each social media platform has a different demographic. Figure out your brands demographic, look at your fan base and compare. Lastly, utilizing email marketing is an amazing tool to have especially when sending out deals and promotions. Who doesn't enjoy a coupon saving a few bucks or a good sale? Everyone is trying to save during the holidays. Let's jump back to why customer service plays a major role in your catering service. Part of your marketing and promotioning is how effective you verbalize your service. Communicating effectively can get you to the next step to closing a sale and gaining customers. Make sure your staff is trained on the catering options and are experts at answering any questions customers may have. Having knowledge about your products will only earn your customers confidence in your business. They want to be able to rely on you to have all the information they need to make a decision. Most restaurants have already finalized their holiday catering menus months or weeks in advance, but if you're barely considering it, the clock is ticking. If you're willing to put in the time and work it could be done in a short amount of time. If executed correctly, these tactics can help you get your catering service up and running. Best of luck!! We believe you can make it happen!